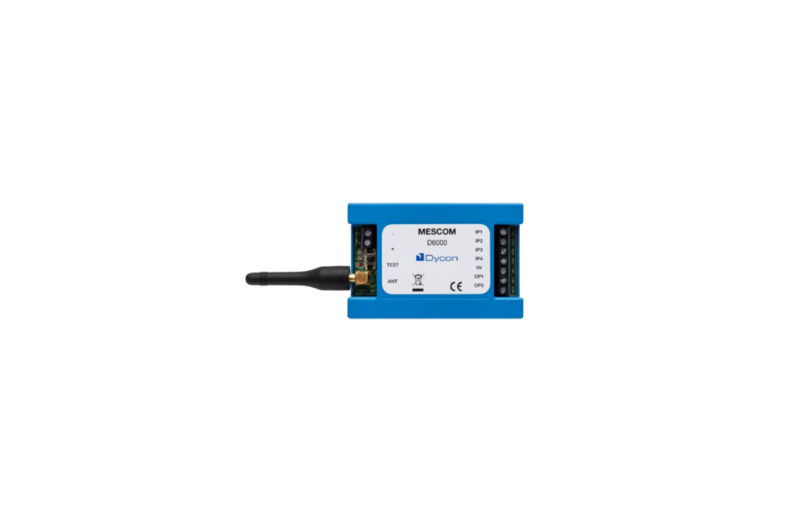 The MesCom is a basic low cost remote telemetry unit with 4 universal inputs and 2 open collector outputs. Communication and configuration with the MesCom is via SMS messages from your mobile phone avoiding the need for a service or monthly subscription. MesCom2 devices have additional functionality to allow reporting to a server and configuration from the Dycon MesCom configuration manager website. Inputs accept 0-3V signals with an internal pull up/down resistor and can be configured as analogue or digital signals. A variety of sensor types can be connected to the MesCom: Volt-free contact, 4-20mA, transistor logic, 3v analogue, 30v analogue with the minimum of external components. Outputs are open collector outputs to ground with back EMF protection for use with small inductive loads (eg relays) with a maximum 100mA load. Internal monitoring of temperature, battery voltage, supply voltage, and radio module state is also performed. The board temperature sensor has an accuracy ±2°C and is measuring the board temperature, not the ambient temperature. All ports, with the exception of the antenna and battery, are 30v tolerant. All input and output can be configured to suit the user’s application.